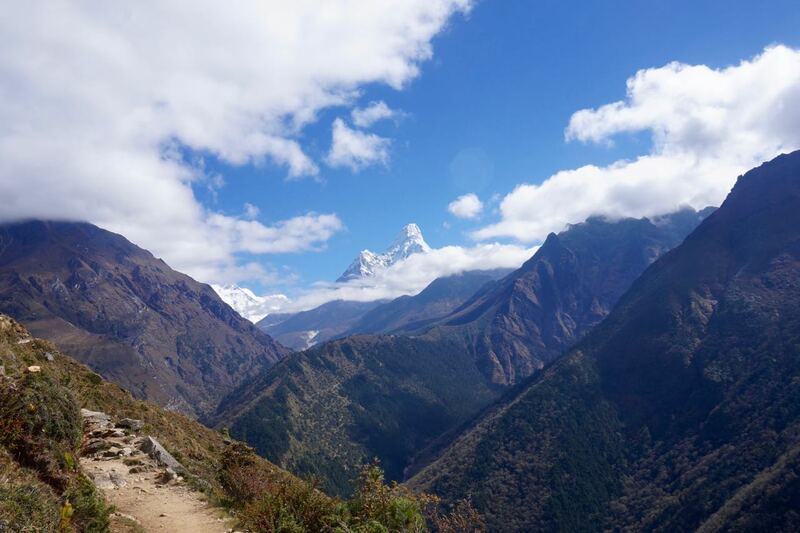 In October of 2016, my husband and I went on our first trek and chose to do it in what could be argued as the best place to do that kind of thing: The Himalayas. 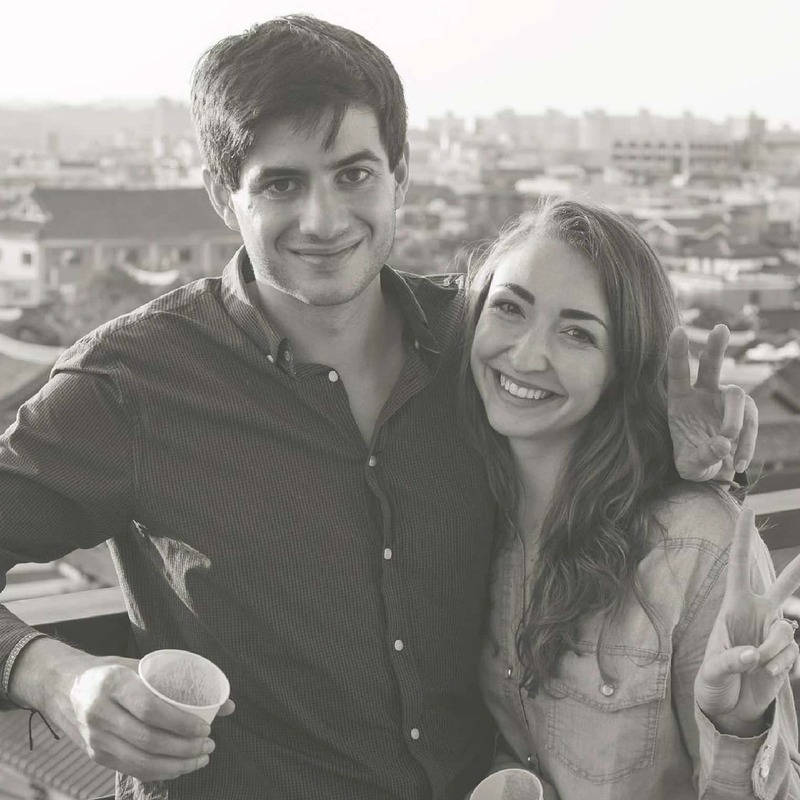 We had just finished our second contract in South Korea as English Teachers, and were eager to take a break from work. 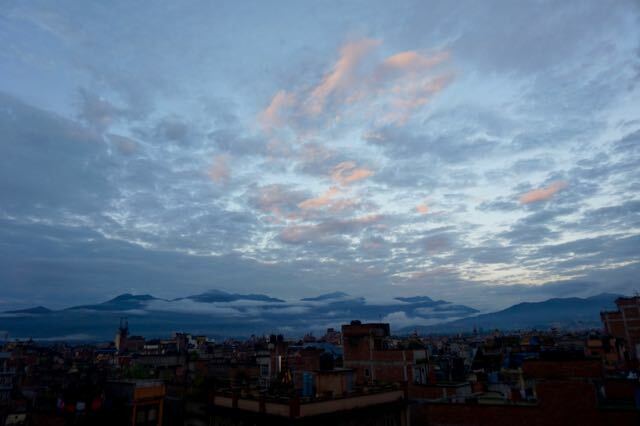 So, we left South Korea and headed for Kathmandu. 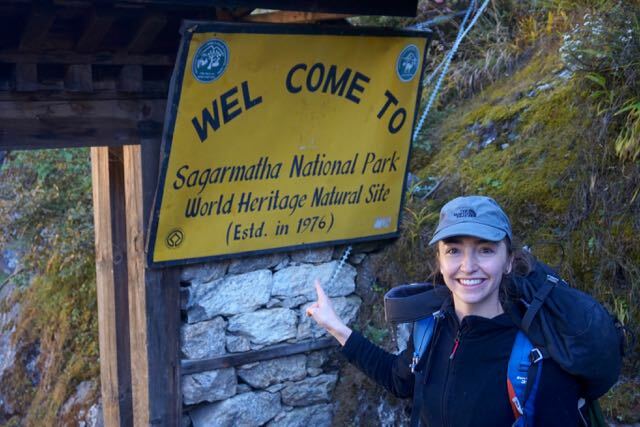 We spent some time relaxing there (we recommend Stupa Guesthouse in Thamel), then packed our bags for our 18 days of traveling, trekking, and viewing some of the largest mountains in the world. For posts on Kathmandu, Pokhara, and Nargarkot, Click on their respective links. This was how the trek was broken up into those 18 days. As you can see, rest days are included as well as the approximate time it took us to reach each daily destination. Also, our planned itinerary did not initially look like this as we had to make some changes along the way. We are both fairly active individuals and both took on running for several months prior to this trip. We did not hire a porter, nor a guide. Everything we needed, we carried on our backs. 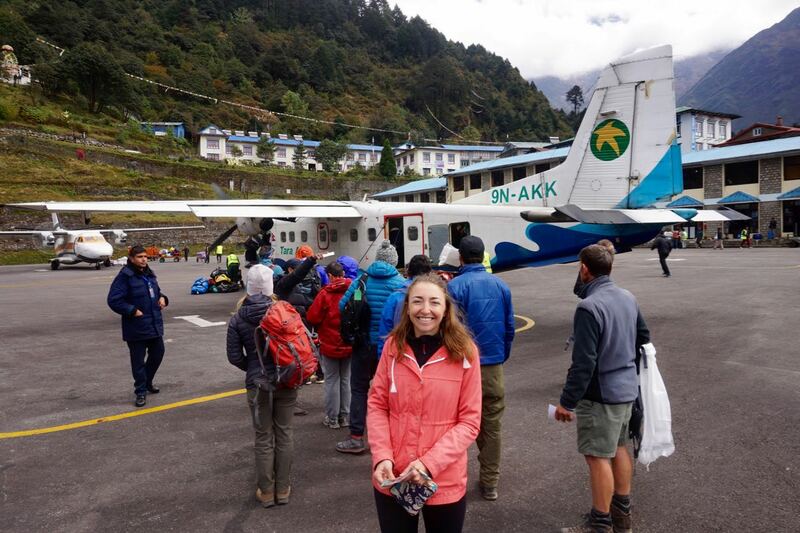 If you are interested in what I brought along for this trip, please have a look at my post on Packing for a Trek in Nepal. Our decision to take a jeep in and to fly out was mostly based on cutting costs. 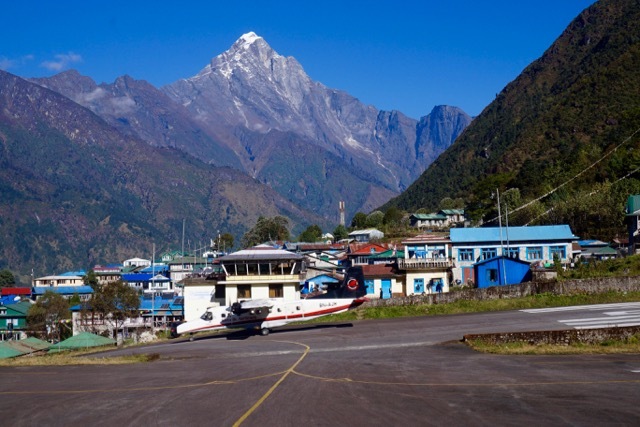 Flights in and from Lukla (Tenzing-Hillary Airport) cost almost $200 CAD per. person for just a one-way. A jeep ride cost us about $30 CAD per. person and it allowed us to see the lush, green views that the lower mountains had to offer. We choose to take a jeep from Kathmandu to Phaplu in order to save money and to experience the lower mountain region where few trekkers go. Our guesthouse owner helped us organize the jeep which cost 3,300 NPR each. 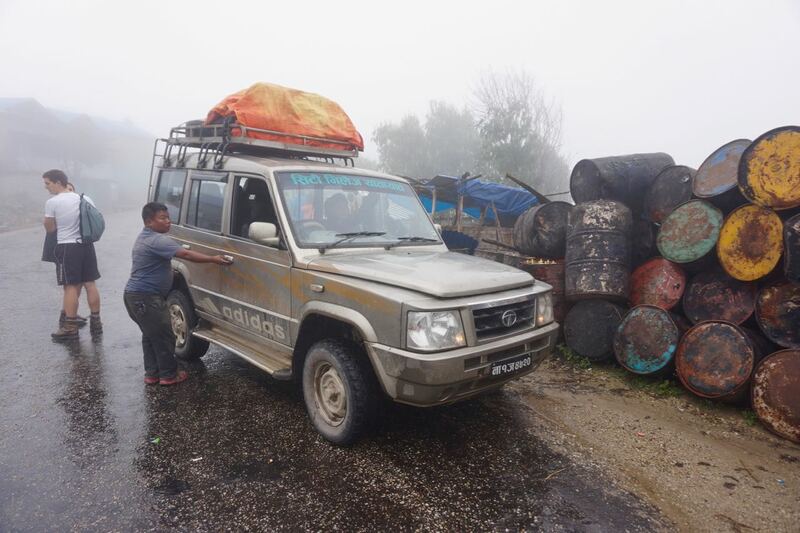 It arrived at 4:30 a.m. but we did not leave Kathmandu until around an hour later (they like to fill the jeep up to capacity – 11 people in total including the driver). Needles to say, it was crowded, cramped, and hot! We were all suspicious that someone else had a better seat, so we advocated that at every rest stop, we switch it up. Of course, every seat was uncomfortable we’d quickly realized. The journey took about 12 hours. We drove on very bumpy ‘highways’, up muddy hills, wove up and down mountains, went through rivers, and over old rock slides. We nearly died going up a slippery hill thinking that our driver was losing control and that we were guaranteed to plummet down the cliff to our death. Most of us were saying some kind of prayer as we held onto anything available for dear life. But we applauded our driver after he calmly maneuvered the jeep to the top and he humbly nodded his head and gave a small smirk already aware that he’d done a good job. 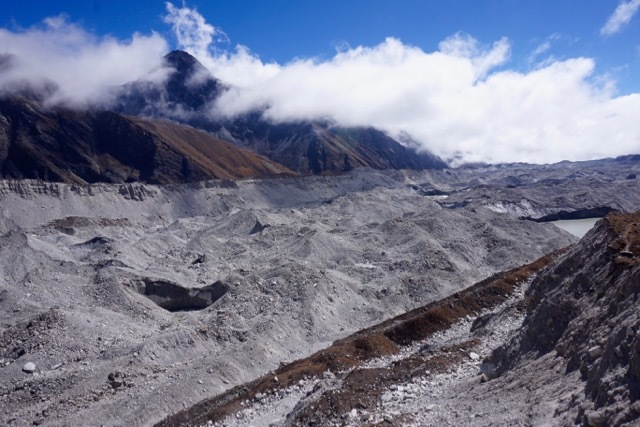 After the long, bumpy journey and frequent stops along the way, we had arrived in Phaplu. It was misty, cold and foggy. Most of us chose to stay in the same tea house which promoted its ‘Momos’. The rooms cost 400 NPR each, which at the time we had thought was an amazing deal! They only served Dal Bhat, a traditional Nepalese meal that is usually eaten twice a day everyday, which was fine with all of us. At 150 NPR a plate with free refills, who would complain? The workers were so friendly and hospitable. They even filled up our water bottles with hot water for free! Further up the mountain, we were to discover that anything free, would be a rarity. The following morning we all ate a chapati (an unleavened flatbread) with either an omelet or honey. The ones with an omelet were delicious and reminded us of some kind of McDonalds egg sandwhich! We washed our food down with milk tea or heavily sweetened instant coffee. Afterwards, we all packed our things, filled up our water bottles, and began our journey. 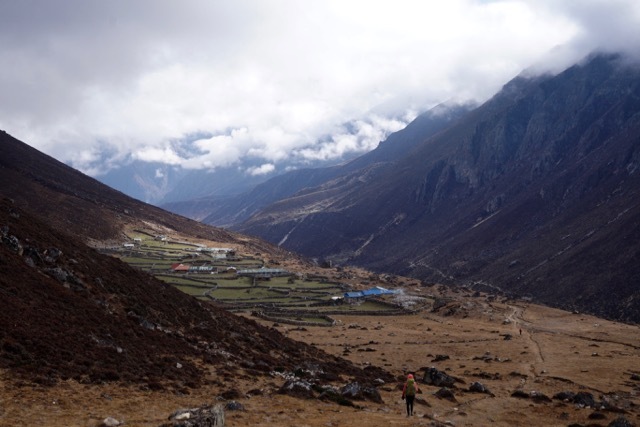 The trail from Phaplu to the next town, Ringmu, was a slow and gradual ascent. The trail was wide enough for a tractor to drive on and in fact, the tire ruts indicated that vehicles could. The trail was either nice, made up of compact dirt or just straight up mud. 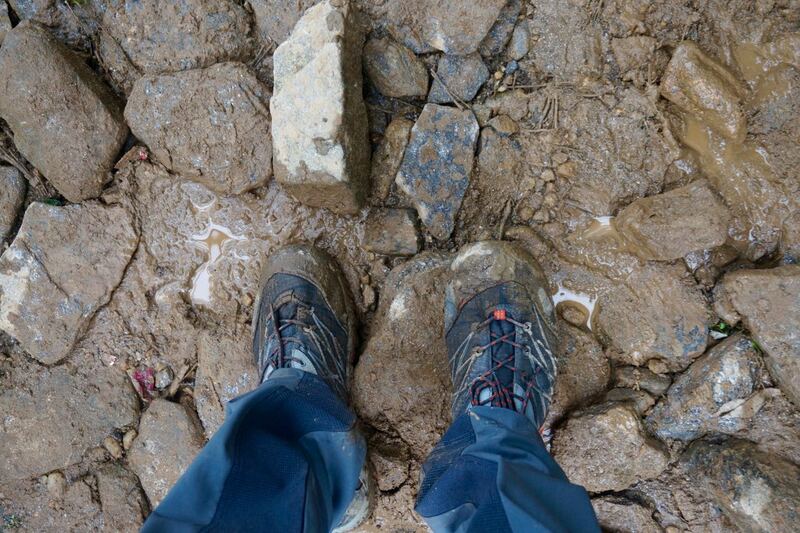 Waterproof boots would have been a good idea, I remember thinking as I looked down at my rock climbing shoes. Despite the mud, beautiful trees, waterfalls, brick tea houses, and mountain views filled our sights. The weather was perfect; it was slightly chilly from the mountain breeze, but the sun shone brightly. There was very little to complain about. We hiked with with an Australian girl whom we had met in our jeep, named Hannah as well as a Nepali porter-guide who seemed to feel the need to stay with us for a while to make sure we’d be ‘ok on our own.’ We were also with Julius, our new Dutch friend, but not to long into our trek had he stopped to use the restroom, and we never saw him again that day. We knew that he was alright, and had originally planned to trek solo, but we he always stayed at the back of our minds. Once in Ringmu, we caught up with the three others who were originally from our jeep. There was Martina from Poland and the Czech couple. There, we enjoyed some yak cheese and tea at the cheese factory alongside the trail. Yak cheese tastes similar to gouda, slightly salty, and strong but still fairly mild overall. We liked it enough to buy some for the trek! We didn’t stay long and left for Taksindu. The trail from that point became very hard. Rock stairs, more mud, and puddles made up the next part of our route. I fell into the mud at one point, and the hand I tried to use to brace my fall, disappeared into 3 feet of it! After two grueling hours of an uphill battle slipping and sliding, we made it to Taksindu La, the first mountain pass of our journey at 3,070 meters. There, it was only Jonny and I, so we stopped for a little picnic lunch and ate some granola, tuna, and dried fruit. Our plan had been to stay in Taksindu for our first night, but as we headed down, we did not see Taksindu at all. 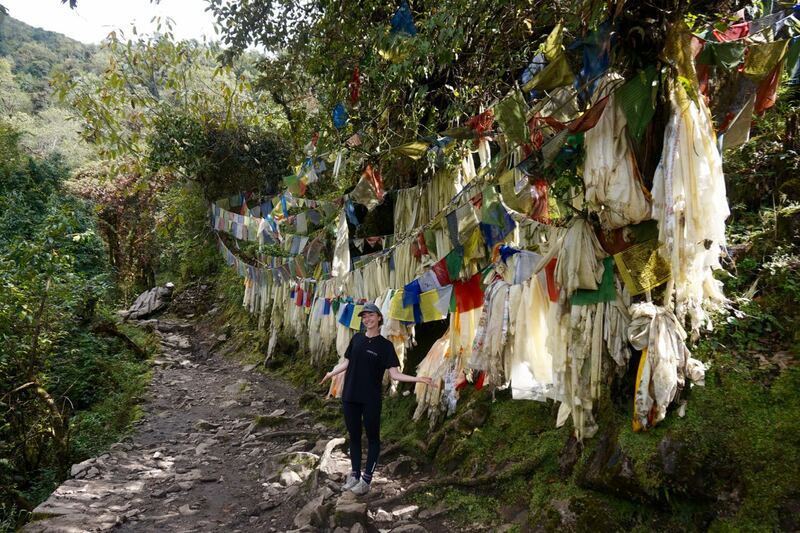 We did come across a beautiful monastery however, and three Nepali teenagers who offered to guide us for a bit down the muddy, steep trail. They were on their way to Kharikhola to see their family which we learned was quite common; village children would go to school in Kathmandu then visit their parents after a period away. Of course, every time they went to visit, they had to take the 12 hour jeep to Phaplu then spend another 12 hours trekking to their village. The teenagers moved so quickly across the rocks, and we awkwardly tried to keep up with our larger bags. Eventually, they disappeared in the distance and again we were on our own. It had been about an hour, so we asked the next passerby about the lost little town. Not to our surprise, we had already passed Taksindu, but Nunthala was not too far away, so we aimed for that town instead. The descent was killing my knees and I began to understand why so many trekkers used poles. I used to think that they were for the ‘older trekkers’ or those who wanted to look especially ‘serious and professional’, I was completely wrong. The poles help distribute your weight into your upper body and arms rather than bearing it all in your knees every time you take a step down. Poles really are a smart choice for this kind of trek. Finally, we arrived in Nunthala at around 3:30 pm after an 8 hour trek. Pretty good for our first day I would say. The tea house that we stayed in was completely empty, say for a young German couple. Our room had a beautiful view of the mountains, the common area was cozy, and they offered hot showers (but for a price of 200 NPR). It cost 200 NPR for the both of us to stay in a room containing two twin beds and a large side table. We now had to pay for hot water from that point on, and food began to get more and more expensive. Since I was so sweaty from our trek, I opted for a free cold shower knowing that I would not be able to do that further up. On our third morning, we ate around 6:30 am with the plan to leave at 7 am. I will never forget Jonny’s breakfast that morning, Our Aussie friend, Hannah, had caught up to us the day before and we were ordering breakfast with her. She ordered the vegetable fried potatoes and Jonny ordered the boiled potatoes. Our meals came out hot and ready to eat and Hannah’s food looked delicious with nicely chopped potatoes, greens, and seasoning. Jonny’s however came out and were, well….just what he’d ordered: boiled potatoes, nothing more, and nothing less. I can still hear the German couple, from across the room, laughing at the sight of it while Jonny doused his boiled potatoes in as much ketchup as he could shake out of the bottle. After breakfast, we left at 7:00 am and began another day of trekking. On our map, it specifically noted that we would be in for a steep descent, and boy was it not lying! Almost immediately after we passed through the rest of Nunthala, the trail went drastically down hill and consisted of jagged, sharp rocks. Again, hiking poles would have been really smart and a lot safer. The trek was more of a downhill climb, I used my hands a lot to stable myself and to avoid falling or spraining an ankle. The second hour became more manageable and eventually we crossed a suspension bridge. This would be the lowest point of our entire trek at 1,680 meters. Of course, what goes down, must go up again and we began another long hike upwards to Kkarikhola, the next large town on our map. After about an hour and a half, we arrived in Kharikhola and stopped for a much deserved Masala tea. It had just begun to rain, so the timing was perfect and it gave us an excuse to order a ‘small pot’ which contains about 7 cups of tea. It was the best Masala tea we had tried on the entire trek! Plus, a small pot was a mere 150 NPR (what a single cup of masala tea typically costs). As we enjoyed our tea, we listened to the chanting that came from the neighboring hilltop monastery. We met a Canadian couple at the tea house and chatted with them for a while. They aimed to make it to Nunthala, so they left quickly in order make it before dark. It was still early, and one of the workers at the tea house pointed out how far the next town, Bupsa, was. It didn’t seem far and it was only around 1 pm, so we headed off for Bupsa. The first hour of our walk to Bupsa was easy and lovely. We still had to pass through the rest of Kharikhola which we discovered quickly is a quaint and cozy town with many brick tea houses and buildings of fun bright colors. There was a lot of music coming from the restaurants and everyone seemed to be in good spirits. We later learned that there was an upcoming festival in which everyone in Nepal participates as a community. We carried on passed the town, across another bridge, and then headed uphill for another hour and a half. We reached Bupsa at around 4:30 pm and were both sore and exhausted. Along the way, many trekkers had recommended the ‘pink’ palace in Bupsa, so we looked for a large, pink building to stay in. We found it, and they were not lying about the good mattresses! The German couple from Nunthala, Anika and Stephen, were there too, so we chatted with them, ate our dinner, and were in bed by 8:30. I woke up to an ill and sick Jonny. He complained of a headache, possibly from too much sun or an oncoming flu. He told me that he needed more time to rest. Of course, I was frustrated and disappointed. I wanted to leave early and complete another 7-hour day trek. I was feeling energized and excited, but all I could do was wait and hope he’d feel better. After a few hours, Jonny began to improve. We left by 11:00 am and were again all set for another day of mountain viewing, rock hoping, and sweat breaking. Our first hour was easy with small rolling hills that we trekked up and down with ease. Despite the fairly level trail, Jonny was still not feeling 100%, plus we both ached from the last two days of trekking. Then, we were faced with a very steep climb which took us about 2 hours to complete. The top of that particular climb was actually a pass at about 3,145 meters, called Kari La. At the top, it was cold and windy; not exactly the best kind of weather for someone who feels fluish. We quickly hurried down the other side, over rocks and slippery, mud sections of the trail. Soon the next town, Paiya, came into view and we were overwhelmed by its beauty. The ground and trees were covered in moss, a few waterfalls spilled between the middle of the town, and impressive boulders stood tall overtaking the tiny roofs of the few tea houses. We crossed a small bridge into the town and began to look for a place to stay. Along the way, we saw a group of men and a small boy circled around what appeared to be a dead animal. 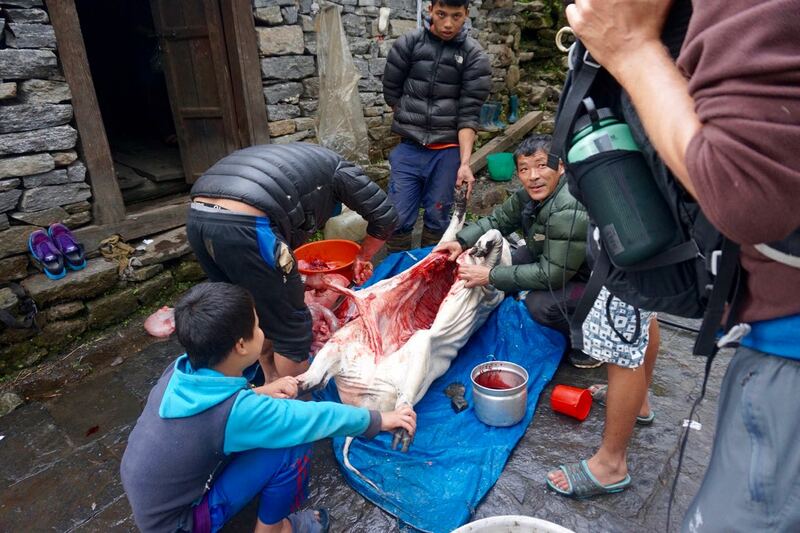 It was a massive pig that they had just slaughtered and were preparing for a special meal. The internal organs had already been removed and lay exposed to the side all piled together in a heap on a blue tarp. We looked in fascination then asked if they would mind if we came closer to have a peak and to take a picture. They all welcomed us over with excited smiles, showing us their ‘soon-to-be-dinner’. I will never forget one of the men lightly kicking what looked like a sad water balloon, back and forth between his feet. When we asked him what it was, another man chimed in that it was the ‘pee sac’. Our disgusted faces just made them laugh more, but we thanked them and went on our way for a place to spend the night. We chose a place with adorable attached cabins made of brick that had blue, yellow, and red trimming around the doors and windows. They were simple, yet clean and cozy. The lady and her daughter were very sweet and hospitable. We were their first guests, so they must have been excited. As we sat in the main area of the tea house, the mother handed us both a heavy blanket to cuddle up in and the daughter turned on the television to play some Hindi dramas while we waited for our supper. It had been a while since we watched TV, so we zoned out to the dramatic life of a teenager and her high school crush. After eating, we both felt tired and worn out. We brushed our teeth, got into our pajamas, and shifted int our sleeping bags. Jonny checked his phone to set the alarm, and that was when we realized that it was only 7:30 pm. We laughed at how early it was yet how tired we felt. Of course, looking back, early nights became somewhat of a normal reality for us because we simply wore ourselves out from the long day of trekking. Plus, mountain villages don’t have much of a ‘night life’, so it wasn’t unusual for the whole town to shut down quite early, possibly because nobody is out past 6:00 pm! 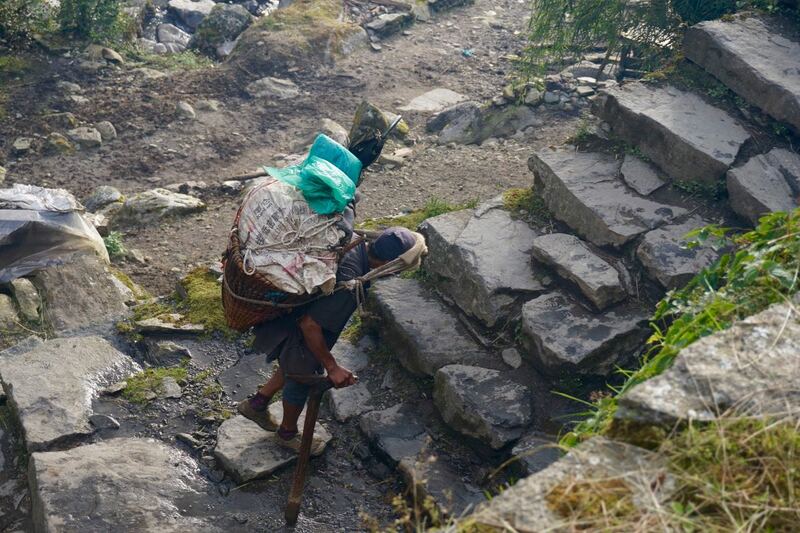 It was also very common to come across porters carrying massive loads on their backs, often more than you’d imagine possible. They used strong ’T’ shaped walking sticks that were also useful for setting their load onto when they needed to rest. This was one of our longer, yet easiesr trekking days. We both woke up feeling great and ready to take on the Himalayan world! The terrain was fairly flat with a bit of an incline to get us to the top of the Chutlok La pass (which was quite anticlimactic given we hadn’t even realized we had gone by it). The next town was Surke. 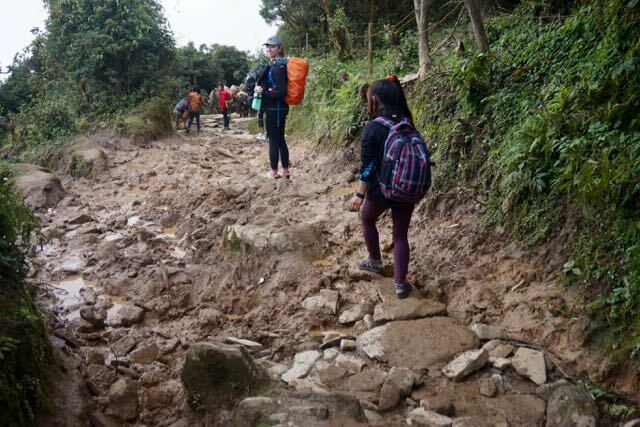 Although the trail was very muddy and slippery (That particular part of the mountain gets very little sunlight), we were professionals by then and knew exactly how to conquer a little bit of messiness. We met a Canadian girl along the way who warned us that getting to Benkar was unlikely. We still thought it was worth aiming for, but thanked her for her advice and moved on. Getting to and through Muse was probably the most difficult parts of the trek that day as it was nothing but steady incline, dry rocky trail, and what felt like a never ending town. It was very different from lush mossy Paiya with it’s dry ground, flat farmland, and quiet surroundings. We stopped at a tea house since we felt the pains of hunger, and both ordered a big meal each. It took about 35 minutes for our lunch to make it to the table, but we soon realized it was because the woman had gone to her garden to pick the very vegetables that went into Jonny’s homemade Spaghetti and my vegetable fried rice. Our food tasted even better because we appreciated the work that had gone into making our meal and how fresh and delicious it tasted. (We have experienced similar situations where we had to wait for what felt like ages for our food, only to find out that someone had been sent out to get the ingredients. Life is very different in the mountains, but there is something very special about how things are done there. I really enjoyed the simplicity of the locals lifestyle and felt overwhelmed by their hospitality. After filling our bellies and enjoying the shade for a little while longer, we headed out for Benkar. Feeling full, energized, and rested, the remainder of our trek was painless and speedy. The only thing that made us move even faster, was the sudden run in we had with the swarm of trekkers coming in from Lukla. 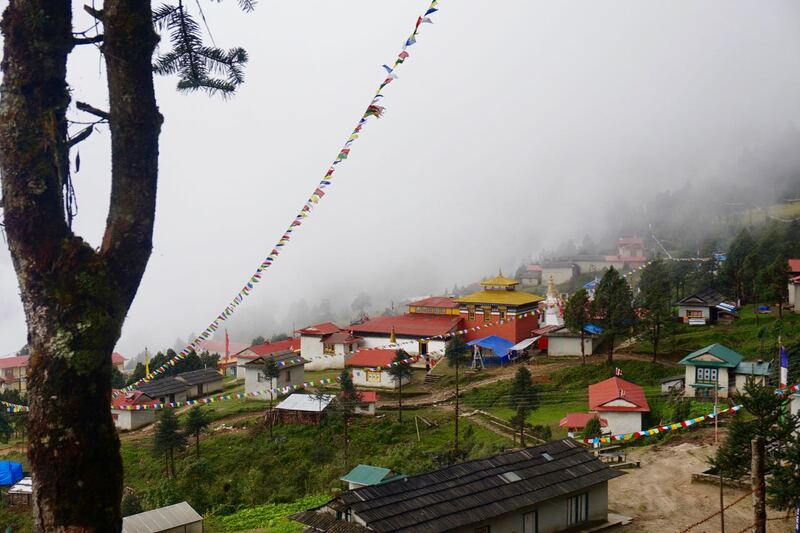 We were in Cheplung, where the two forks in the path meet and those who started in Jiri, Salleri, or Phaplu met with trekkers who flew in to Lukla. The change in traffic on the paths became dramatically different. We were shocked at how many people there were after having trekked for 3 1/2 days hardly running into no more than a hands worth of people a day. At first, we were a little turned off by what we saw, but then again we had to remember that we were there during peak season, the large amount of trekkers would put money into the pockets of locals, and we too were a ‘part’ of the very traffic that frustrated us. So, we shrugged our shoulders and set our sights on Benkar. 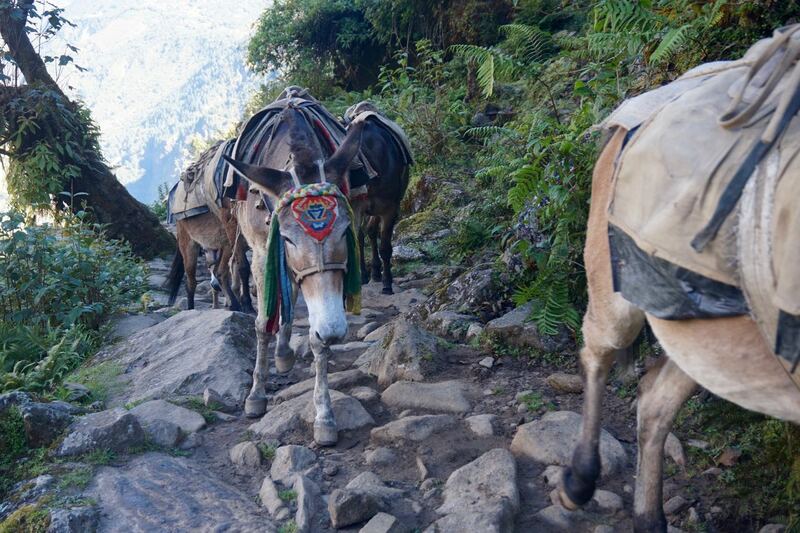 All throughout our journey towards Namche, we came across teams of mules either making their way up or carefully working their way down the paths carrying large loads on their backs containing rice, kerosene, and other goods needed for mountain life. I will never forget the familiar sounds of their bells lightly clanging, announcing their approach as they walked. We skipped through Phakding which according to our research, was where many groups choose to stay for their first night. 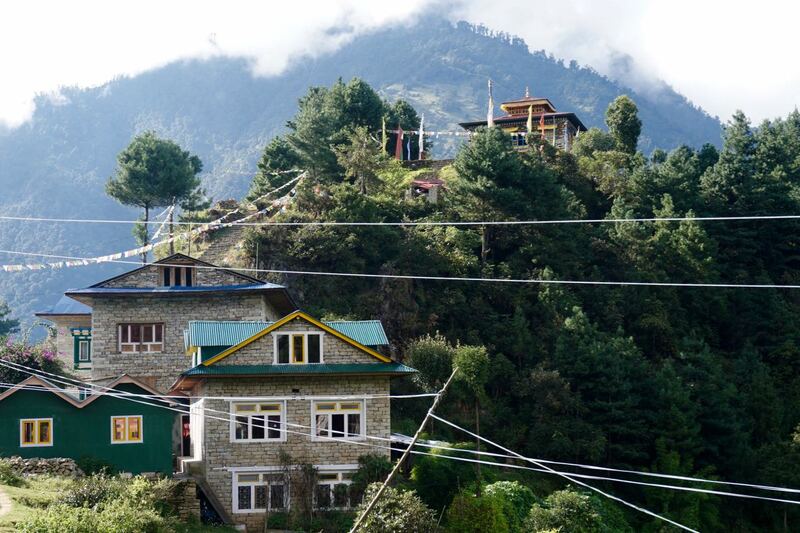 So, in order to avoid crowded tea houses, we had picked Benkar as an alternative destination. We were pleasantly pleased with our choice once we’d finally made it there because we found a wonderful tea house right next to a waterfall called, ‘Hotel Waterfall’. The rooms were well priced, they had great hot showers for 200 NPR, and they make a mean carrot and coriander soup! We liked it so much, that we planned to return on our way to Lukla. 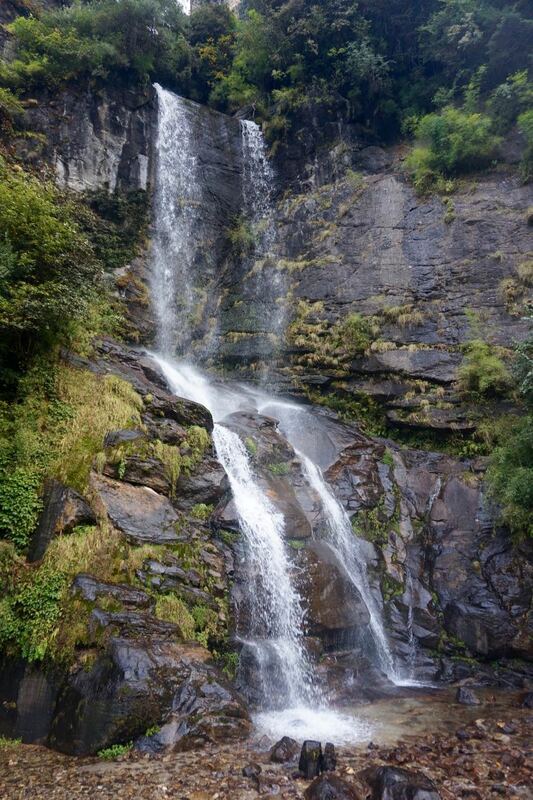 It is easy to find, just get to Benkar and it will be after the waterfall, up the rock stairs, and to your right. Our room had a lovely view of the river and mountains, so try to get a room facing that direction! The waterfall before the hotel we stayed in. The hotel has an outdoor eating area with a waterfall view as well. 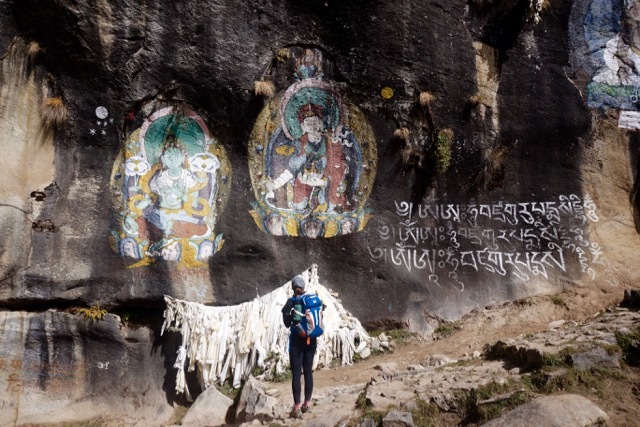 Our plan to stay in Benkar was also carefully decided because we had read about and been warned that the hike up to Namche was the hardest part of the trek. We hoped to shorten the journey as much as possible so that we could save our energy for the steep incline that would bring us from 2,630 meters all the way to 3,440 meters. We also wanted to get a head start of the larger groups of people we labelled the ‘Phakdingers’ since we knew many guided treks made Phakding their first stop. It took us about 35 minutes to get to Monjo which is the town before Namche. There we needed to purchase a pass each in order to enter Sagarmatha National Park. The pass cost 3,555 NPR each and it had to be paid with cash. The process was straight forward and quite quick. We were there before the larger crowds, so there was very little waiting involved. You just show your TIMS card and pay the fee. Then they stamp your TIMS and you’re basically ready to enter the park. About to go into Sagarmatha National Park. Now despite the warnings, I found the hike up to Namche difficult, but not as bad as I had expected. We just took our time and rested when it was needed. Admittedly, I was tired of the uphill nonsense after about an hour and kept praying that Namche would be around the next corner. I would highly recommend having enough water for this part of the trek, as we did not find refill options along the way. Also, bring some snacks high in protein and electrolyte packets to replenish your energy levels and to keep you hydrated. They can be purchased for 15 NPR each in Kathmandu. We found that having at least 1 litre of water with electrolytes between the two of us really helped during the harder hikes. Don’t let the first part after Monjo deceive you just because you walk downhill for a while. Once you see a suspension bridge high above, you will know what comes next. From that point on, it is up,up, UP! You walk on mainly packed earth and rocky stairs. It is a constant stretch of switch backs and heavy sweating. When we saw the first houses of Namche around noon, we wanted nothing more than to eat at the first tea house which is exactly what we did. After lunch, we walked through Namche to check out the town we had read so much about. 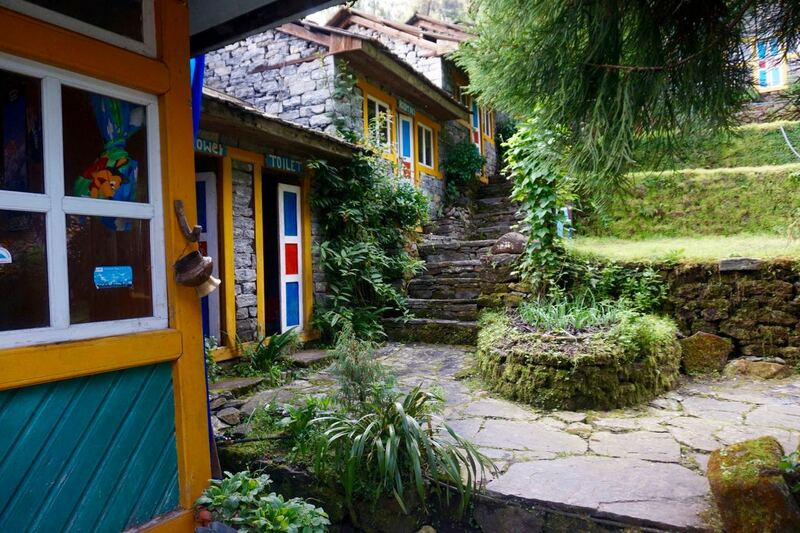 It really is an amazing place with all of the amenities and comforts you at above 3,400 meters! There are plenty of restaurants, bars, cafes, trekking shops, and souvenir stands throughout the place. There you can take out or exchange money at the banks as well (it is your last chance to do so!). I did not expect Namche to be so…comfortable, but it was. 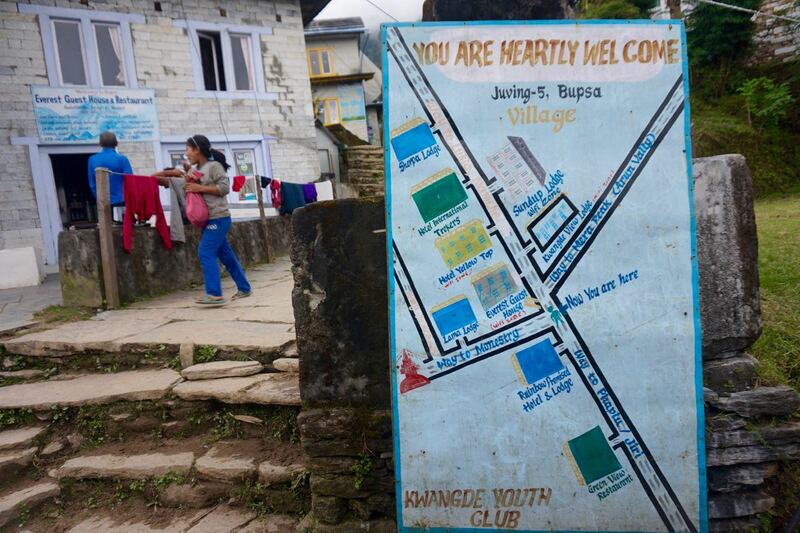 Walking through the town of Namche, where you can find jut about anything. 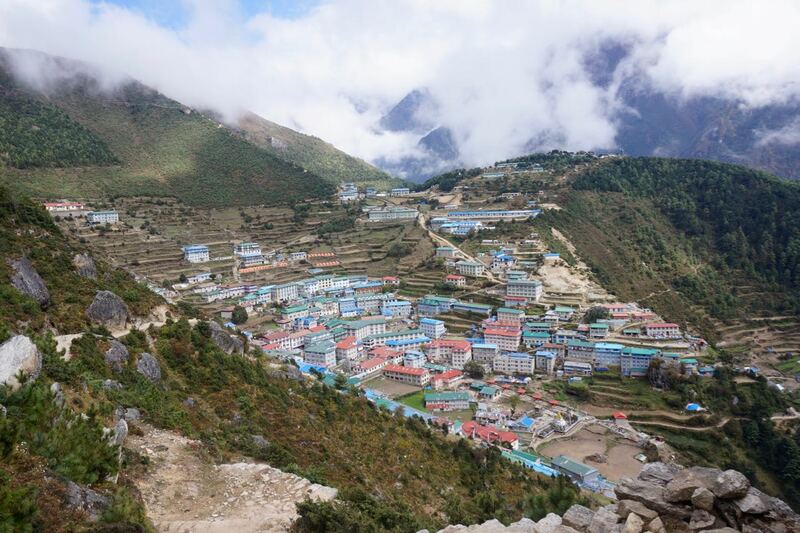 Our next task was to find accommodations in Namche which we expected would be plentiful, but more commercialized than the homestay-style places we had grown used to. There are many hotels in Namche, something you will not really find anywhere else on the trek, but they come at a higher cost. We began by checking out a hotel recommended by the tea house we had eaten lunch at. Unfortunately we were immediately turned off by it’s cold atmosphere, the hosts urgency to tell us that we MUST eat all meals there, and because they wanted to charge us for a cold shower. We got out of there fast and instead settled on a smaller tea house where we were warmly welcomed, they were willing to let us have a cold shower for free, and our room ended up being right on a corner with three large windows and a view overlooking the town. After settling in, we went out for a coffee at Himalayan Java (which I highly recommend for its quality coffee, free wifi, and comfortable seating). 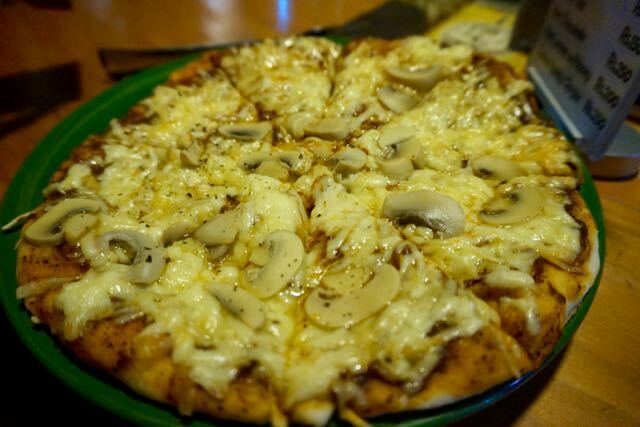 Later, we ate at Namche Bakery and Pizza which serves delicious pizzas (we had the mushroom) and even better burgers! They have an oven that was flown in by helicopter and carried by several men to be assembled at the restaurant. 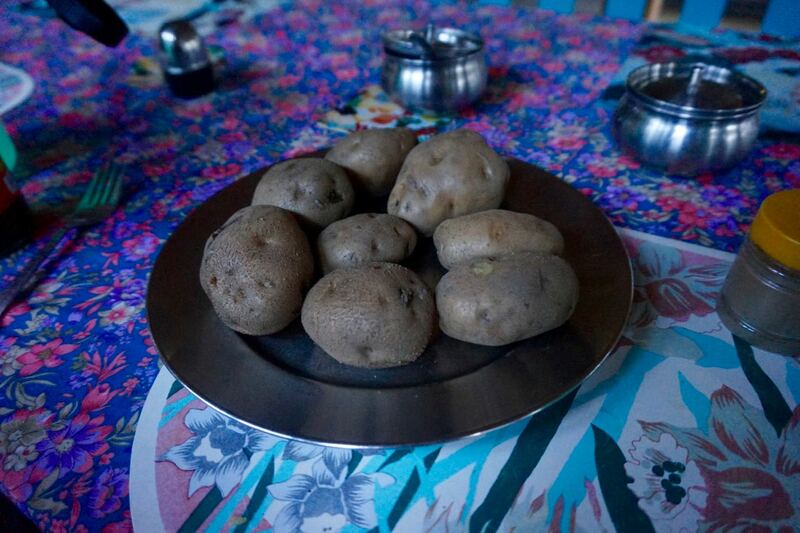 Any other pizza served in tea houses along the trek will be cooked on a chapati and the toppings melted by cooking it in a covered frying pan. The result is a limp, doughy pizza and never comparable to one that is oven baked. But, be prepared to hear the wrath of your tea house host if you skip eating meals at their establishment, we certainly did that night as we tried to sneak into our room unnoticed. We were careful to eat there for the remainder of our meals. 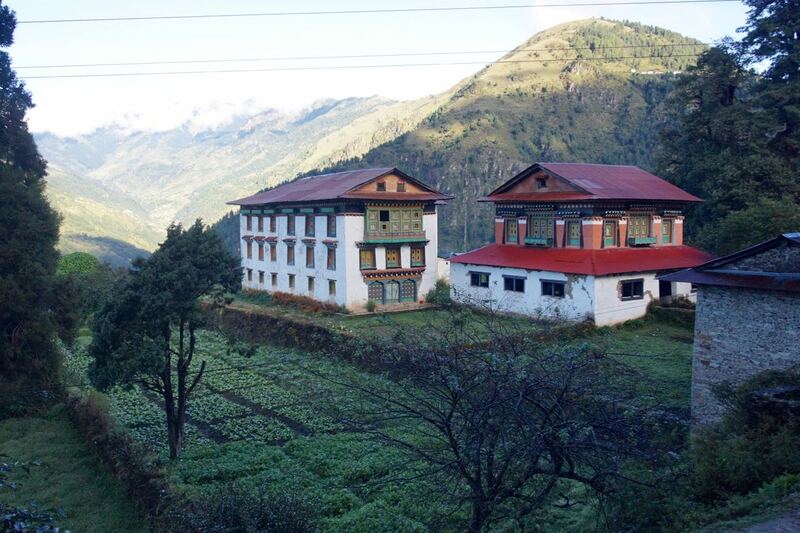 Most trekkers will stay in Namche for two nights, and for good reason. The altitude gain at such a fast pace means your are more susceptible to experiencing the symptoms of Altitude Mountain Sickness (AMS). 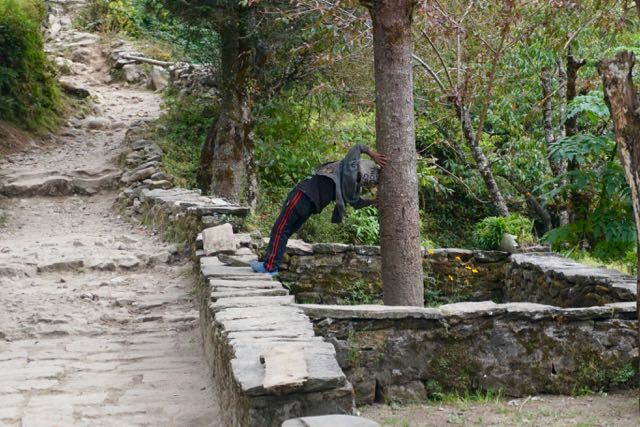 Your body needs time to adjust and one of the best ways to help it along is to hike further up, then return back to Namche. This aids the process of acclimatization. Even if you do not show any signs of AMS (headache, dizziness, nausea, loss of appetite, etc. ), it is always a good preventative to ‘hike high, and sleep low’ as the saying goes. It does not mean you must spend the entirety of that day trekking, a couple hours is sufficient so long as you gain about a couple hundred meters. 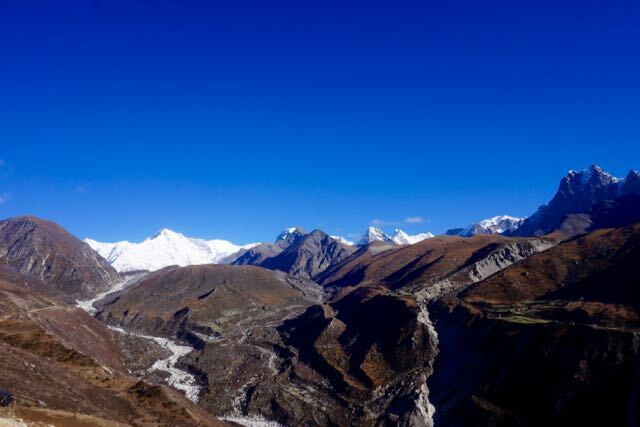 Many trekkers hike up to Syanboche (3,790 meters) or Khumjung (3,780 meters). We hiked about three quarters of the way to Khumjung, then turned back and relaxed for the rest of the day. A herd of yaks passing us by. Word of advice: Move out of the way! This day was probably just as difficult if not worse than our trek up to Namche. Maybe it was because we had relaxed so much that our bodies finally realized what they’d been through, maybe it was the amazing pizza we had eaten the night before, or more realistically, it was the altitude. Still, we made it to Dole. The beginning of the trek had been quite easy. Everyone going up to EBC was also on the same trail as us, so it was quite crowded, We came to the town of Khyangjuma and stopped there for a water bottle refill. From there, the trail broke away from the EBC trail and became steep, hard rock steps and cliff side narrow walking paths all the way to Maula. There we stopped for a quick tea and to the enjoy the view. Afterwards, we sped down a steep, rocky trail to Phortse Thanga right next to a river. We went to a tiny cafe for lunch, which was basically run out of a local families home. We both ordered Dal Bhat, then waited outside. The daughter and son of the lady cooking for us were so adorable. I played games with the little girl, and we all watched her two year old brother who kept getting way too close to the yaks as he attempted to swat them with a plant. We moved indoors to eat, and beside us, the family also sat down to eat their meal. It was a neat local experience to see them eating the traditional way with their hands. The lady also gave us a side of fermented spicy peppers. My mouth always waters when I think about how spicy, and tasty they were. We said our goodbyes to the family, then continued on our way. Again, we had to head on uphill. It began as a steady ascent, then became very difficult. We were both really struggling, and beginning to dread hiking more. Once we got to a waterfall, there was one last difficult hill that we needed to hike up. The rest of the trek that day became quite flat and manageable. We made it to Dole around 3:30 pm, and chose one of the first places we came across to stay. We were the only guests that night except for one other solo trekker. We spent the time playing our dice game or reading. Then we went to sleep early. Did I mention that it had gotten really cold on the trek? Well it really did. From Dole to Luzza, there was absolutely no sunshine and we were hiking in 3 layers of clothing, wearing gioves, and a toque. The first part was a very hard ascent out of the valley where Dole was situated, then the remainder of the walk to Machherma was quite level and easy. The problem for me was no longer the strain of the hike, but my ever growing chilly toes! It was time to double up my socks and to get the down jacket out of the bottom of my bag. Luckily for us, Machherma was only about 3 hours away so we arrived there by 11:00 am. Since we had so much time on our hands, we decided to attend the free talk about altitude sickness at the clinic in Machherma. We read and played games until 2:45, then headed to the 3:00 meeting. I would suggest anyone attend one of those meetings either in Machherma or Gokyo. Not only do they inform you about preventative ways to avoid AMS, but also about porter welfare and health. The meetings run everyday at 3:00 pm and are completely free. Bring some rupees if you want to lend your support to the clinic. For a few NPR, you can find out what your oxygen levels are at, purchase some chapstick, sunscreen, or a badge. Proceeds go to the clinic and allow the doctors there to treat porters at a very low cost. After the meeting, Jonny and I headed back to our tea house to play more games, read, and wait for dinner. The days might sound pretty mundane and simple, but that’s because they are. The thing though was at the time, I rarely found myself bored and actually enjoyed having very little to do. The simplicity of eating, trekking, relaxing, and sleeping was quite therapeutic and enjoyable. 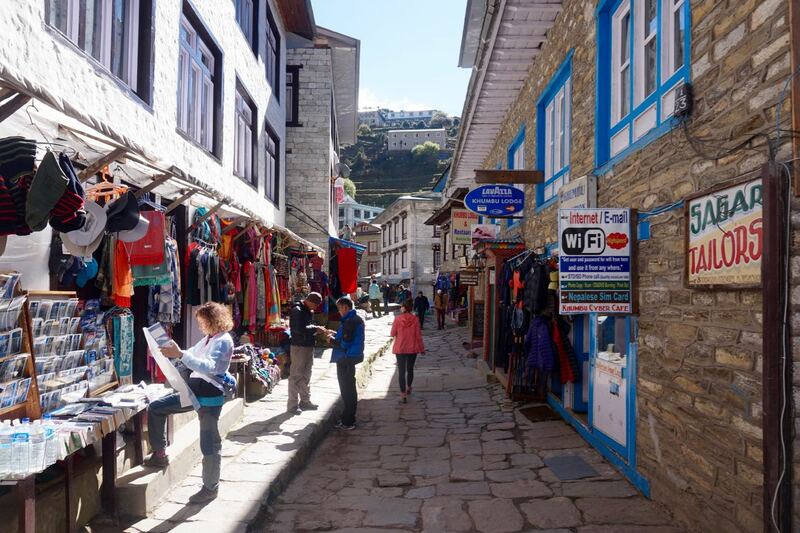 There were no motorized vehicles, wifi signals, TV’s, coffee shops, grocery stores, or even regular restaurants (except for Namche). 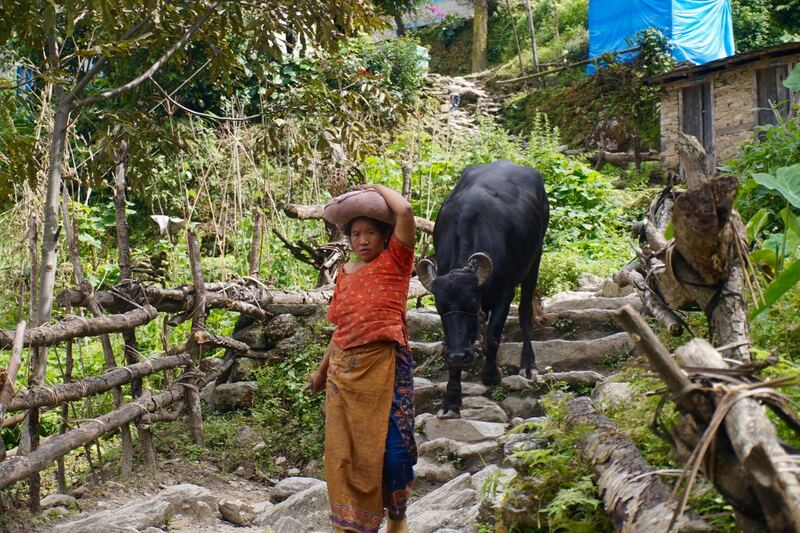 Life in the mountains is very different, as is life when you trek through them. 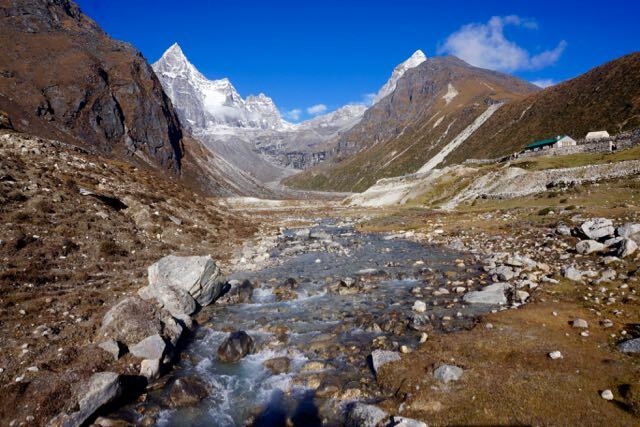 Leaving Machherma to head for Gokyo began with a stunning view of the mountains. First, we had to once again hike up and out of the valley where the town was, but at the top of the hill, we could see snow capped mountains all around us. Everyone pulled out their cameras and began snapping pictures. It was such a surprise because visibility had been so poor the day before that we couldn’t see anything. We stood there in awe, gawking over those rocky natural statues towering over our heads. It was quite a site, one I will never forget. The first lake was not very big, and only about a meter deep. It was green in color, likely from the algae, and a little underwhelming. Still, it was nice to see a lake, and was a great appetizer for more to come. The second lake was a lot larger, and more blue. We stopped to take some pictures, but kept going as we grew more eager for Gokyo. Once we arrived at the third lake, we were taken aback by how blue and beautiful it was. We sat on some rocks and ate some food we had packed for a small picnic lunch. Afterwards, we continued to to walk along the lake until the town came into view. 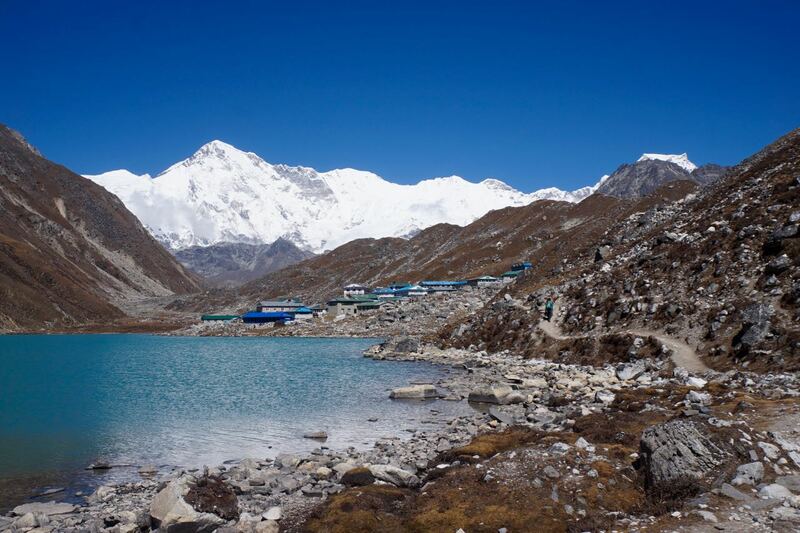 Gokyo is built right on the lake, so most of the properties have somewhat of a lake view.  We were planning to stay there for 3 nights, so we wanted to find a good place for the best price. We tried about five tea houses before choosing one. It didn’t look like much from the outside, but because we were the first guests, our room was one with an amazing view of the lake. The walls were painted yellow, which gave it such a warm feeling, and the room was on a corner, so lots of natural sunlight could shine through. The room was 200 NPR, so luckily accommodations never increased in price the higher up we went. 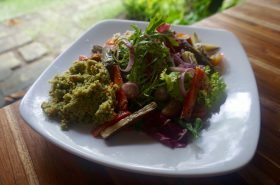 Food, however, did as a basic dal bhat was priced at 150 NPR back in Phupla, then shot up to 600 NPR in Gokyo. Despite our financial frustrations, Gokyo was a wonderful place to be. We just loved having a lake to look at and a place to relax in for a few nights. Did I mention that there is a bakery there? With a great view of the lake, the little bakery claims to be the highest in the world at 4,790 meters. I am not sure if that is true, but what I am sure of is how delicious everything is there. They have cheesecake, chocolate cake, apple pie, giant chocolate donuts, fresh bread, brownies, and croissants. Of course, all of the baked goods come with a price tag. Each item cost between 350-500 NPR. 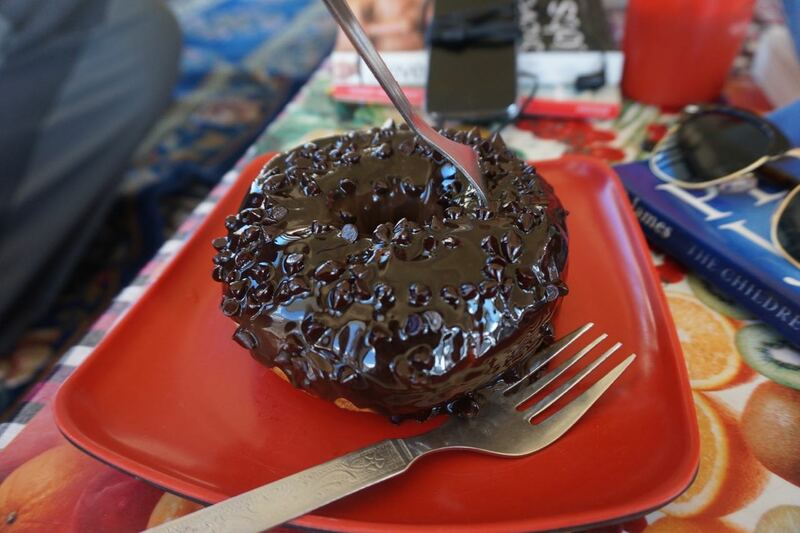 We may have been frustrated by the increasing price of a dal bhat, but a giant chocolate donut always seems worth it especially when you haven’t enjoyed such a treat in a while. 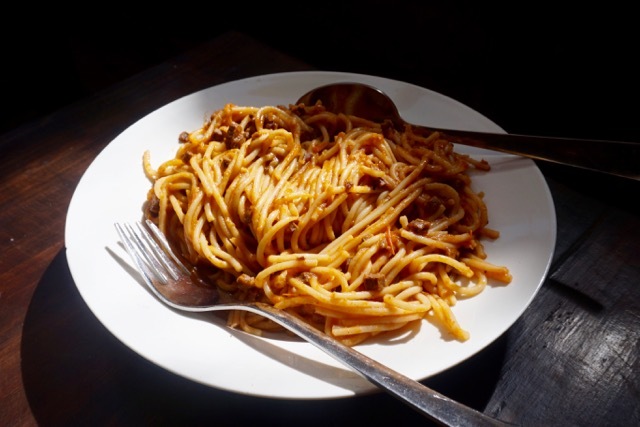 So, yes we indulged…maybe too much and I am sure that any weight that we had lost was probably gained back just by our 3 nights spent in Gokyo. Our first full day in Gokyo was spent walking to the fourth lake. We had planned to go as far as the fifth or sixth lake, until we were told that it would take us about 3 hours…one way. We did not want to overexert ourselves on what was meant to be more of a ‘rest’ day, so we decided to just check out lake number 4 and on our way back, take a detour to the glacier. It took us about 45 minutes to get to the ugly, grey lake. Yes I said it. The lake was not a pretty sight, and quite disappointing. Also, I had dragged Jonny all the way out to see it, so I felt a little embarrassed. Plus, it was cold and windy and I had prepared to have a nice picnic by the ‘beautiful’ fourth lake. The day just didn’t work out the way I had planned. We decided to check out the glacier in hopes that it would be a little bit more impressive. We hiked up to the top of the hill then looked out across at what was a massive, amazing glacier. I had never seen one before and was just stunned by it’s vastness and how odd it looked. I had expected it to be white or bluish in color, but it was actually grey and almost looked like a desert of rocky dunes with the odd lake here and there. I don’t know if I would call it beautiful, but it was certainly awesome to see. We decided to walk along the ridge back to Gokyo, so that we could look at it some more. On our way back, we found a large rock that blocked the wind and ate our lunch overlooking the grey glacier, instead of the grey lake. 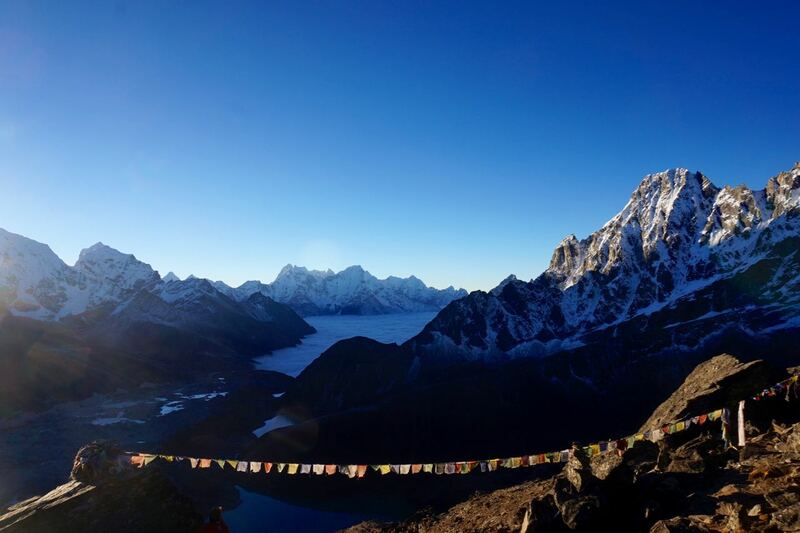 I had been waiting for the moment to see Mount Everest, and had been told that Gokyo Ri was the place to see it. Some had even said that the view from it is arguably better than that of Kala Patthar. 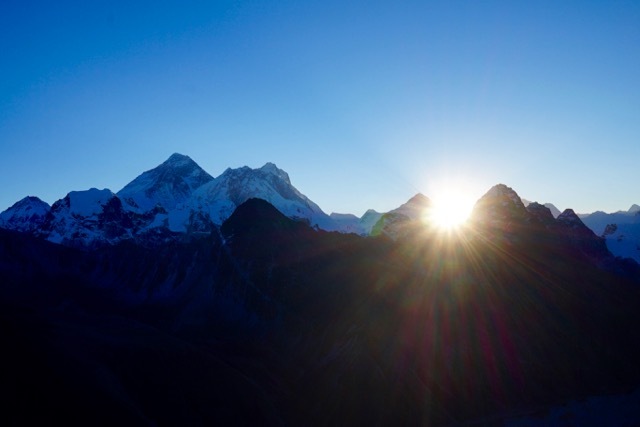 Jonny was not up for an early morning hike, but I was determined to wake by 4:00 am to catch the sunrise at the summit of Gokyo Ri , even if I had to do it solo. I left the tea house at around quarter after 4 with my flashlight, water, my down jacket, and a camera. It was quite cold at first, but once I began ascending, I became warm very quickly. The flashlight was a necessity, but mine was weak and absolutely terrible. What made me feel better were the bobbing lights coming from the trekkers head lamps either ahead or behind me on the trail. I was anxious to make it to the top before the sun rose, and began to panic as the sky began to lighten. The hike was hard and slippery due to the loose rocks everywhere. I noticed that I had to take rest breaks more frequently as I neared the top as the oxygen grew thinner. What drove me crazy as well were the two shelves on Gokyo Ri that made me feel like I was close to the summit, only to realize that I had just reached the top of a shelf, and still had a long way to go. Still, after 1 hour and 35 minutes I made it to the top. About six other people were already there taking pictures and soaking in the view. I couldn’t believe how cold my fingers and toes felt, so taking pictures was proving to be difficult. Still, the view was absolutely breathtaking. From the summit, you have a 360 degree view all around you, and there in the direction of Tokyo and beyond was Everest. I was shocked actually by how it did not tower over the other mountains around it, because I was forgetting that 8 of the highest mountains in the world are in the Himalayas. That doesn’t mean that I wasn’t smiling from ear to ear as I looked at the tallest mountain in the world. Plus, I made it there 10 minutes before the sun rose, so I had plenty of time for pictures and indulging in a view I may never get to see again in my lifetime. It really was amazing, and none of the pictures that I took that day will quite do it justice. I headed down after about half an hour spent on the summit. At the bottom of the mountain, Jonny was waiting for me and so we walked back to the tea house together. The remainder of the day we spent relaxing and reading at the bakery. 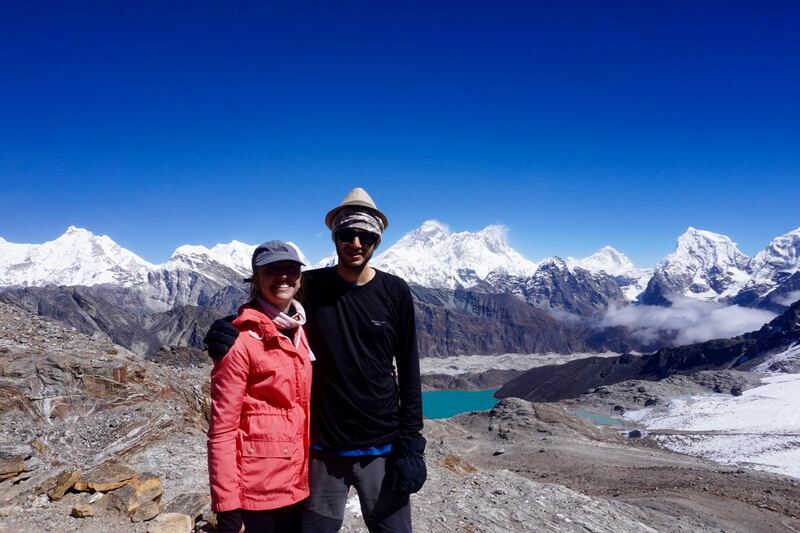 The following day we would leave, so we wanted to enjoy our time in Gokyo before then. Finally, the time had come to leave Gokyo and to begin our journey back. Rather than take the route we came, we chose to head slightly west across Renjo La Pass then follow the trail to the next town, Lumde. 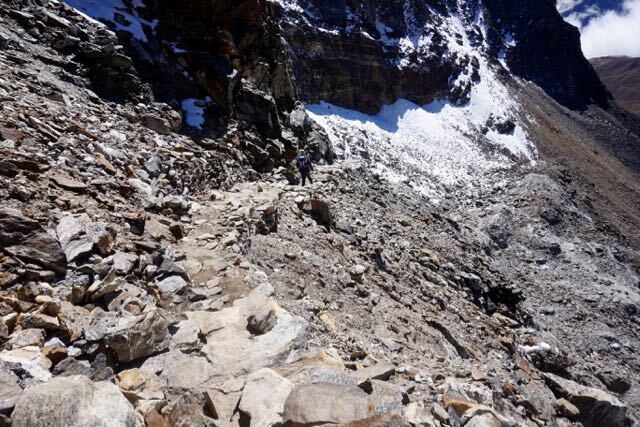 Getting to Lumde from Gokyo was definitely not an easy feat. 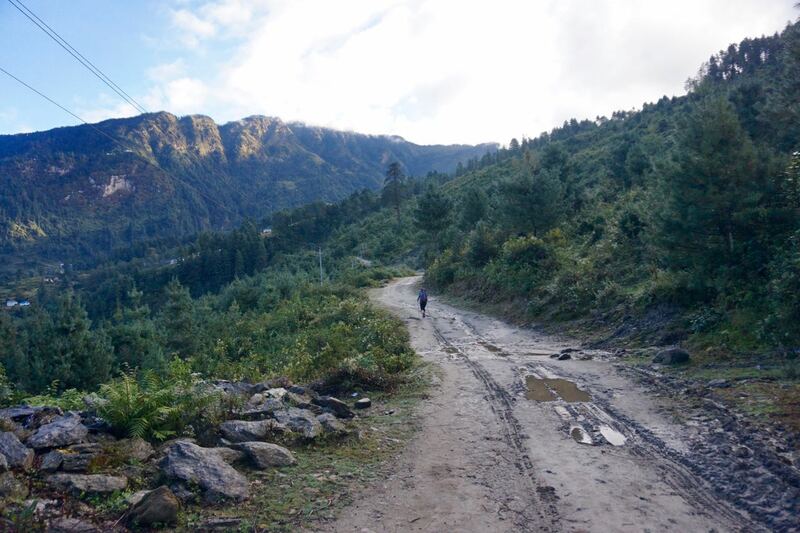 First, we had to cross Renjo La which would become the highest point of our trek. Jonny was really struggling with the lack of oxygen and had to stop frequently to catch his breath. 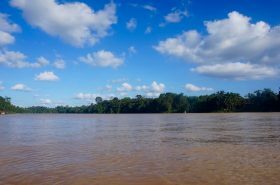 I was beginning to worry, because he said he felt like he was having a panic attack several times, and we had been trekking on fairly steady terrain. What we thought would take no more than 2.5 hours to get to the top ended up taking us 4.5 hours. It really was very hard, lots of rock climbing, slippery pebbles, and thin air. Even still, we both made it to the top and the view was absolutely stunning! Hiking down was much easier on our breathing, but very hard on our knees. We thought that the next town would not be too far from the base of Renjo La, but it still ended up taking us about 3 hours to get to. It was a strange feeling as well since it was the first time that we did not run into a single trekker or even a porter along the way. A dark fog had crept in, and we were a little concerned that we had taken a wrong turn. It was all beginning to feel very creepy, not to mention we went by a lake with really nice sand….SAND…in the mountains! Despite our concerns, we walked on convinced that there was no other way. Wouldn’t we have noticed a split in the trail? Why were there no other trekkers? Why was there not an animal in sight? The questions rolled into our minds just as more fog rolled across the path. In about 2.5 painfully slow hours, we finally saw a village. It had to be Lumde, but even if it wasn’t, we still would have stayed there. Both physically and mentally exhausted, we stumbled down the hill towards civilization once more. We found a nice looking tea house, but for the first time were turned away because it was full to capacity. Where were all of those people trekking earlier? We sighed with frustration and went to the next place, praying that it would be vacant and warm. To our luck, it was and we spent the rest of the evening eating macaroni and cheese and playing cards by the stove, happy to be warm and relieved to be safe. Another early rise and we were off to Namche! The trail being quite flat with a slow decent made it an easy trek down. We found that it was difficult to follow just one path at times since the ground was worn down in several places. Needless to say, all the trails were heading in the same general direction, so it really didn’t seem to matter. This leg of the journey was a lot more developed than our journey from Gokyo to Lumde. Tea houses were dotted along the way and small villages popped up often. We stopped in Thame to eat a bounty bar and to rest. We were eager to keep going so we didn’t sit for long. After Thame, we crossed a bridge over a roaring river and saw some beautiful paintings on the rock face of the cliff on the opposite side. From there, the journey began to take us up again. After a couple more hours, we began to walk through village after village so frequently that we could not tell when one would end or begin. This was a good sign that we were closing in on Namche. We stopped for tea and cookies at a tea house with a friendly couple. They told us that we only had about an hour to go before Namche. We thanked them and set out for the last stretch and sure enough after an hour, we’d made it back. It felt good to be back in a place with good coffee, delicious food, and other simple comforts. We decided to stay in the hotel above Himalayan Java called Hotel Namche??? because, well, it was closer to a sip of a hot Americano. 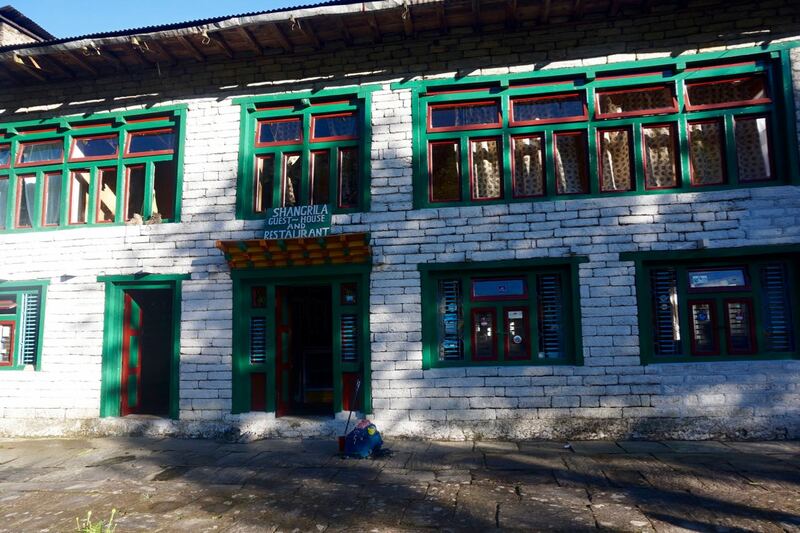 It’s a great little hotel with a large dining area, a wonderful staff, and it’s where Sir Edmund Hillary stayed. 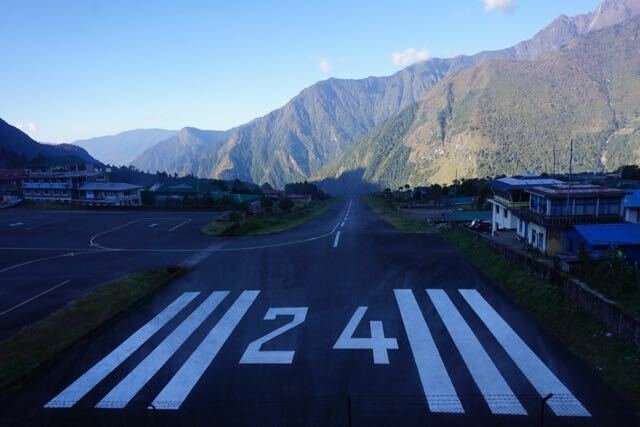 Our flight had already been booked prior to the beginning of our trip, so we had some days to kill before heading to Lukla. Of course, it was a no brainer to relax and enjoy Namche. We spent the time blogging, drinking coffee after coffee, eating the foods we’d missed, and checking out the free movies that they play in various bars and cafes. 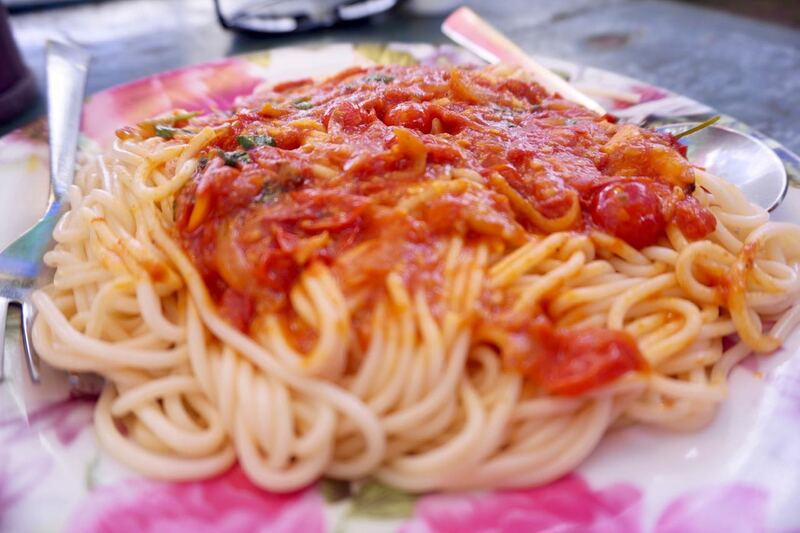 Spaghetti Bolognese anyone? Yes please! We had anticipated a long walk to Lukla from Namche, but we did not think it would be very difficult; we were totally and completely wrong. 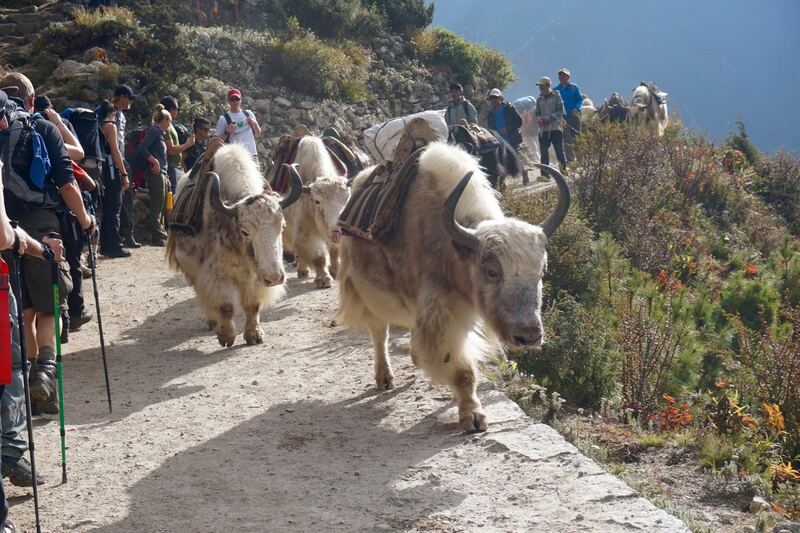 Getting down the steep hill from Namche can be done very quickly, that is if there are no other trekkers on the path or herds of yaks, but there were. Plus, the trail does not continue to go down, eventually it does go up again. We were over walking for hours with big weights on our backs, smelly clothes, and blistering feet. 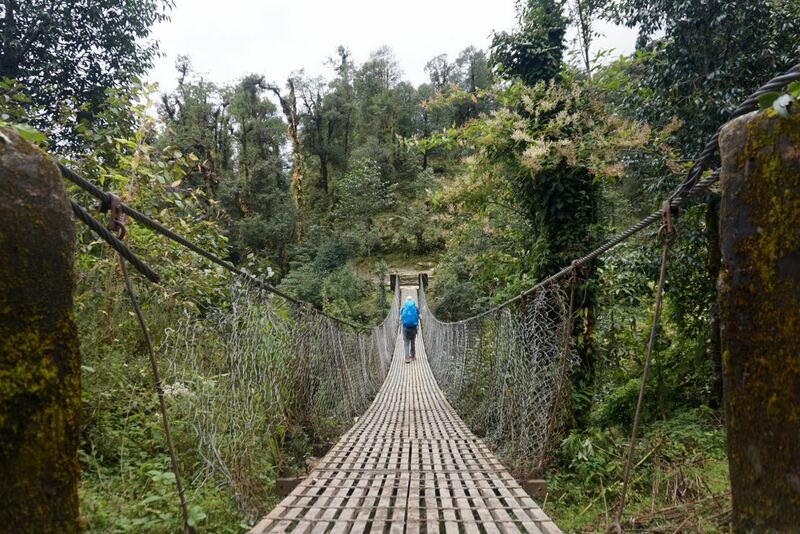 It was no longer a trek of awe and wonder, we just wanted to get to Lukla! We had seen everything we’d wanted to see, now it was about getting to a place to set down our backpacks. Everything about that day felt longer. We stopped more than we ever had before to rest and catch our breathe. The thing is, the trek itself was really not that hard. I think we had simply lost our motivation. Plus, we both knew that if we had left Namche 1 day earlier, we could have split the journey back into 2 days rather than 1. I would recommend that to anyone if they have the time to spare. 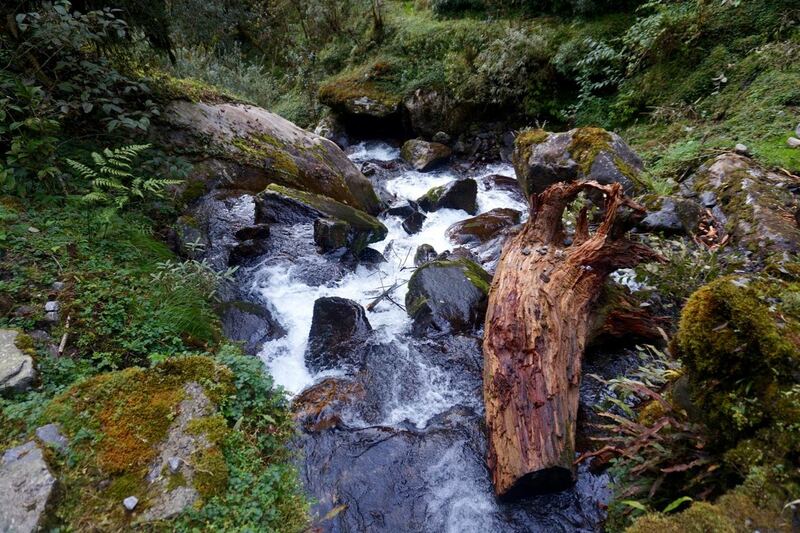 Trek to Benkar or Phakding, then go to Lukla on the 2nd day. 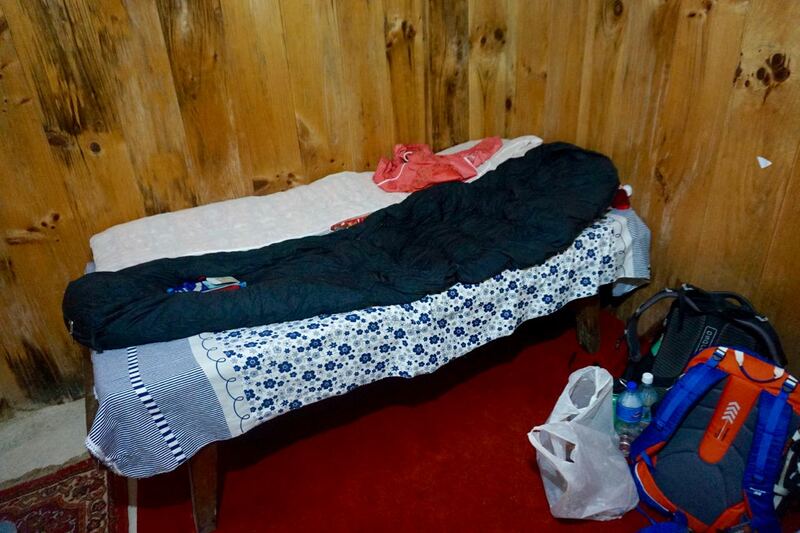 Once we reached Lukla, we quickly found a tea house then crashed on our beds for a nap. Later, we had our supper and figured out where the airport was so we knew where to head for our morning flight the following day. The day had come, our last and final day in the Himalayas! We woke up eager and excited for our flight from what is deemed to be the most dangerous airport in the world. We ate a quick breakfast, grabbed our luggage, then walked the 15 minute journey there. The first sign of the airport was it’s 527 meter runway we could stand in front of with simply a chainlink fence to separate us. That was what our plane would fly off of, given it could get to an appropriate speed in time. Of course, the airport is also unlike any we had been to. Once we got inside, it seemed as though no one knew where to go, where to line up, and when their plane was due to depart. Even the staff seemed uncertain or simply indifferent. We waited about an hour before we ‘checked in’, then walked through a door separated by a red curtain for the security check. After that, we sat and waited…and waited…and waited. We waited for an hour, then another, and even another. At one point, there were no planes coming or going, so we began to worry. Both Jonny and I actually left on separate occasions from the airport to get a tea and a muffin from the nearby German bakery. The woman at security didn’t seem to mind at all! After nearly 4 hours, our plane finally flew in. Within minutes, the attendant at the door called out our number, directed us to the tarmac, the plane was loaded, and it began to taxi to the runway. The plane was tiny with only one seat on either side of the aisle and the cockpit completely open to the view of the passengers. The pilots guided the plane into position, and revved up the engines. This was it, we were actually about to fly off of a mountain, and I was both terrified and excited. The plane moved forward then sped up quickly, down the runway, closer and closer to the end. It didn’t feel like it was going fast enough and I felt the panic rise in the back of my throat. But, the nose rose up then the entire plane lifted off of the runway and into the air. We were flying back to Kathmandu, away from our amazing journey through the mountains, and towards our next adventure. I saw from my window the trail we had taken as it snaked through forest, over rivers, past villages, and into the Himalayas. I told myself that I would go back. I had to go back because that trek was one of the best and most rewarding times of my life! 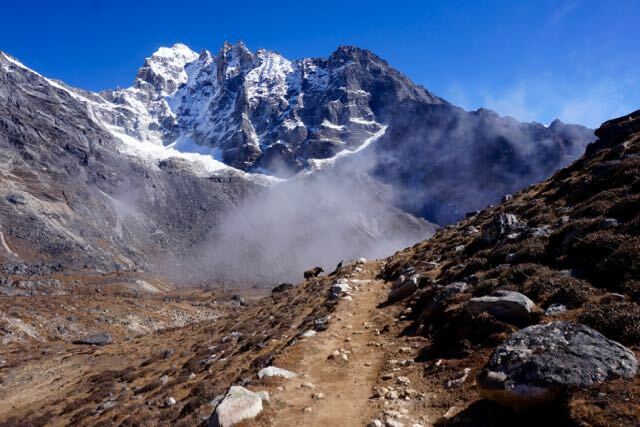 If you are interested in going to Nepal and would like to go on a trek. Please do not hesitate to ask us any questions that may come up. We have learned a lot from our own experience and would love to share that with you!